Mayor Thomas M. Menino recently joined Liberty Mutual Insurance Chairman and CEO David H. Long for a ribbon cutting ceremony to unveil the City of Boston’s first universally accessible playground at the Charlestown Navy Yard. 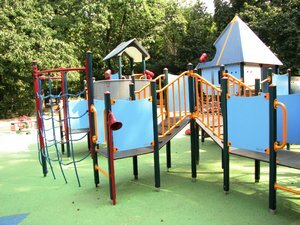 According to the City of Boston, this project will help to provide close to 25,000 square foot boardwalk with nearly 65 pieces of play equipment within a nearly 20,000 square foot rubber playground area. This is going to be the first playground in the area that caters to both children and adults. Liberty Mutual stepped up with a $1 million donation. Our Boston child injury attorneys understand that everyone in the community is going to benefit from this new city addition. Unfortunately, there are more than 200,000 children who land in an emergency room with injuries from public playgrounds in the U.S. each and every year. Most injuries happen when a child falls from the equipment onto the ground. Officials with the Centers for Disease Control and Prevention (CDC), report about half of playground-related injuries are severe-fractures, internal injuries, concussions, dislocations, and amputations. The playground is a bittersweet place. Children grow and develop interaction skills, but they can also be severely injured or worse. Between 2001 and 2008, an average of 218,851 preschool and elementary children received emergency department care for injuries that occurred on playground equipment. Approximately 15 percent of the injuries were classified as severe, with 3 percent requiring hospitalization. -Make sure that the ground is adequate. You want to make sure that there’s at least a foot of pea gravel, mulch, wood chips or safety-tested rubber or rubber-like materials. -Make sure that the protective floor spans at least 6 feet, in all directions, of the equipment. -Play structures that are higher than 30 inches should be placed at least 9 feet from one another. -Inspect for any dangerous hardware, like protruding bolt ends of an open “S” hooks. -Make sure that there are no dangerously open spaces that could potentially trap children, like spaces between ladders or in between guardrails. These spaces should measure less than 4 inches but no more than 9. -Look around for any sharp edges on any of the equipment. -Check the area for any kind of tripping dangers, like tree stumps, rocks or concrete footings. -Make sure that all elevated play surfaces have the proper fall protection, like guardrails. -Make sure that you always carefully supervise your children while at play. -Check the safety netting for tears or frays. Torn netting could allow a child to climb onto the outer portions of the equipment and fall onto a hard surface. -Keep an eye out for hot surfaces. The CPSC is aware of nearly 30 thermal burn incidents from 2001‐2008. Of those incidents, 10 were associated with plastic, rubber, or other nonmetal surfaces, and seven were associated with metal surfaces. If you are dealing with a child injury, contact Jeffrey S. Glassman for a free and confidential appointment to discuss your rights. Call 888-367-2900.